For refugees to integrate into society, it’s not enough to give them food and an apartment. They also need jobs and social recognition. Deutsche Telekom has come up with a plan. In 2016, a group of German companies established an initiative called "Wir zusammen” (All Together). Three dozen large and medium-sized companies wanted to help integrate refugees by offering them traineeships and, where possible, jobs too. Thirty-six companies were involved at the start - it's now about twice that number. One of the companies is Deutsche Telekom, which has its headquarters in Bonn. The telecommunications company employs about 218,000 people worldwide and is always looking for new, young talent. 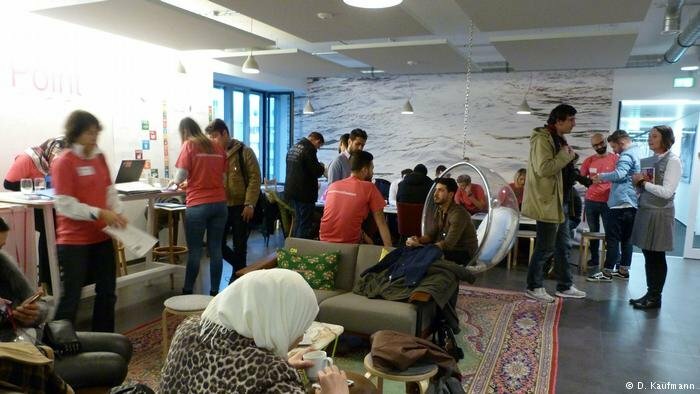 Before Telekom trains any refugees, it offers suitable applicants a half-year paid internship. Deutsche Telekom likes to use its own judgment as to whether someone is suitable. School or university graduation records, or comprehensive records of work histories, are not the deciding factor for Telekom. In most cases, asylum seekers can't provide those records. Instead, following Telekom's own motto "personality matters,” it's the personal impression a candidate makes that is important. And Telekom's managers hope to meet people who make good impressions during their "Bewerbertag” (applicants' day). Click here for more information on Telekom's initiative for refugees. ‘Speed dating' is what Birgit Klesper calls it. Klesper is a senior vice-president at Group Corporate Responsibility. 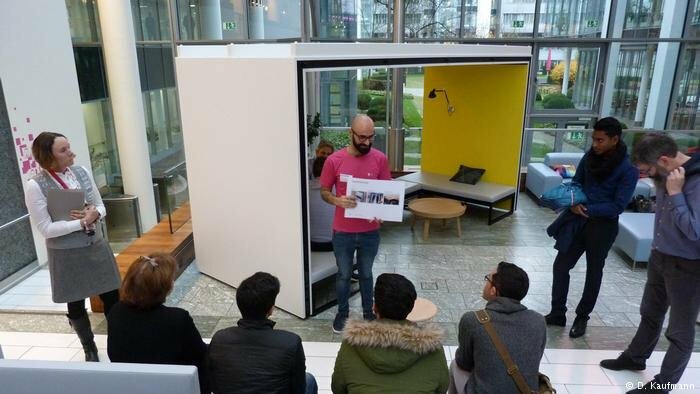 The Deutsche Telekom event took place at their headquarters in Bonn at the end of November. And Klesper's comparison to speed dating is not all that far-fetched. In a number of interviews, the applicants chat with employees from different departments to give them an initial impression of their German language skills, their mindset, their personal requirements and expectations, and potential suitability for employment in one area or another. If a candidate passes these interviews, he or she is given an internship for six months. After the initial period with a new employee, Birgit Klesper says a department manager will sometimes decide that a particular intern would fit in better in a different section, and another intern would have been more suited to this one. In the foyer of the Telekom building, Katja Werz, the company's media spokeswoman, welcomes a handful of journalists and takes them through the building to the applicants' day Info Point. But first there's a surprise in the foyer. The candidates gather around an employee in a red Telekom t-shirt, who takes them through the company policies. The employee is Badr from Iraq. Badr is an intern who has succeeded in getting through the first steps of the application process. He explains the corporate culture to the candidates. And he does it in German. It's not clear how much the young refugees understand – later it will be clear that not everyone can speak German – but they are certainly all attentive and interested. 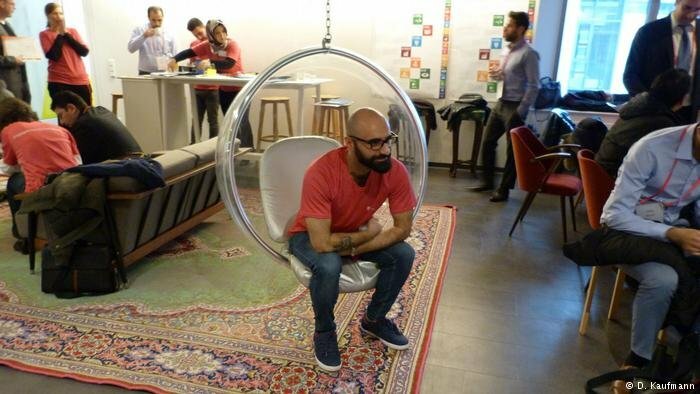 Badr studied physics in Iraq and now works in the communications department. When I asked him whether he would have anything against having his picture taken and being quoted for this story, he just smiled and agreed, but on one condition – that his name not be used. Almost every refugee still has family in the country they leave and wants to avoid creating problems for relatives or friends. That is why I quote the refugees in this report with just a first name or no name at all. We are at the Info Point. Between interviews, the applicants are waiting and relaxing over coffee and Middle Eastern sweets – Badr is telling an applicant who doesn't know exactly what to expect what his options might be. The young man is a lawyer but can't use his qualifications in Germany. After hearing about the young man's interests and skills, Badr suggests he consider doing a business course and says he should raise the idea in his interview. Majed from Syria has had her first interview and is smiling a bit nervously but still seems optimistic. When I ask her how it went, she says she has a good feeling but it's still early days – we need to wait and see. Back home she worked as a secretary, and she hopes she'll be able to get similar training here. She answers in English – but she's already started learning German. My impression is that she'll manage the language easily. Besides, as Katja Werz tells me later, it is company policy to speak English if an employee is unable to follow a discussion in German. While the speed-interviews happen around us in the office, Barbara Costanzo, a project leader for "Telekom hilft” (Telekom Helps), introduces three young men to me. They have finished internships with the Bonn company. They are also examples of how flexible refugees have to be – and indeed are. A young man from Syria answers the question, "what did you do in your homeland?” by saying he studied tourism. He is now doing an internship in the communications department. Barbara Costanzo says his situation is quite common. And it can be a problem when young people take a more conventional route to looking for a job or a traineeship. Employment agencies will try to place them in the same job or sector in which they worked before. But at Telekom's applicants' day, Barbara Costanzo says there's much greater scope to take a flexible and more creative approach to the applicants and their capabilities. Someone who has learned to deal with tourists will probably be a communicative person, Barbara Costanzo says, and they may also be able to get along with people in another industry. The project manager says their cooperation with employment agencies does work well – but she says there's a lot less bureaucracy at Telekom's applicants' day. The young people, for their part, are not here via a recommendation from the Job Centre. Some of them found out from friends about the applicants' day. Others heard about it on social media. I hear the words ‘on Facebook' more than once. Majed from Syria has told her husband about the Telekom initiative. She's invested a lot of hope in it. It is true of Majed and indeed all the applicants that they are not shy. As they wait for their interviews, the applicants come across as quiet and reserved but still quite self-assured. That said, they will be on their own with the interviewer – that happens behind closed doors. In this respect, these young applicants are perhaps not typical refugees – even if there were such a thing. But it makes sense. The applicants' day appeals to people who take the initiative and are open to new things. And that is just what Telekom hopes to get from the applicants. More than just a drop in the ocean? The Telekom project may just be a drop in the ocean – time will tell. The number of refugees integrated this way is unlikely to run into the thousands. The people at Deutsche Telekom are reluctant to talk numbers. Costanzo points out that the project has only been going for a year. So she can't answer my question about who, and how many, will go on to a traineeship or even a job after their internship. Klesper remembers how, at the start of the project, there were about as many applicants as available internships. She says that has changed, and there are now many more. And if other companies join the ‘Wir zusammen' initiative and start projects like Deutsche Telekom's, it will slowly add up to more than just a few drops in the ocean. What are the advantages of working legally in Germany?